Note: For the first time, Italian Intrigues features a guest blogger. Please welcome Cassy Pickard, another Sister in Crime. My first post on Novel Adventurers appears December 1. As writers we invent. We create worlds that first exist only in our minds and then we figure out how to put that on a page so others are invited to join us. We want readers to see our characters as people who are advancing through their struggles. We also want them to see the streets our creations live on, smell the aromas from where they eat, hear the buzz of the motorcycles along the street and learn about the details of their lives. My stories take place in Italy. It’s a country I have been visiting for forty years. We own a house there. I go many times a year. And, I have learned that I can’t “feel” the country on Google or on any website. Let me share with you an experience I had a few years ago. My husband and I were traveling in Italy and he made the genius suggestion that I stay on to research a portion of the book I was writing. “Take a week,” he said. “I’m fine heading back. You have lots to do.” I hesitated, then grabbed the moment. I spent five days doing just that. I walked Rome in ways I had not done before. Even with the many times I have been there, this was different. I was looking for the apartment house my heroine lived in. I took photographs not of classic sites but of where my gal lived and worked—memories for me to be sure to keep for my pages to be written. In Rome, women don’t usually jog or run. I planned the path for my protagonist to flee in a moment of terror and then I ran it. So, I literally busted my buns to get from Point A to Point B, timing it. I had to make the scene for my book real. People stared. One man yelled to me, asking if I needed help. I ended up joining a huge protest group who were rallying about civil rights. I realized it was a good place to hide from the bad guy chasing me. I almost began to believe he was real. My heart was pounding. The protesters were chanting. I had to pull out my map to reorient. I was actually slightly nervous to leave the safety of the large anonymous crowd for my imaginary pursuer could miraculously appear. 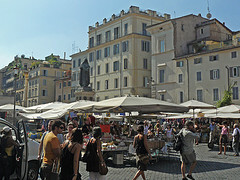 Then as I moved on to Piazza Campo dei Fiori, I had forgotten that the large farmer’s market filled the square. It was rich with details that I could never have found on Google or any other site. Chickens hung in the makeshift stalls, huge bins of herbs and spices lined the front of a number of vendors, a full kitchen shop was set up on multiple tables, and of course the flowers. I could have bought one of everything. I’m a total lover of outdoor markets. I decided to have lunch at the edge of the piazza and watch the parade of people. With a glass of wine in hand, it became clear that I had to be there. I had to feel it, smell it, watch it, and then hopefully know it. And my dear character was right by my side. She loved it too. That was until I had to make her life much more difficult with what I plotted for the next scene. After reading your post, I had to laugh. I sort of do the same thing that you did (without the drama you experienced!). My novel is set on the Outer Banks. Every time I visit, I act out the parts, go over the setting and take pictures. Getting fiction to feel real is a must. Of course, I can only get so far into reality because my novel is a paranormal romantic mystery. Even so, I "see" the unreal happening in the real place. Guess like most fiction writers, I'm a bit nuts! Oh,Elaine, I think you should try for that paranormal romantic experience! Great post, Cassy and Patricia! Thanks to both of you, I get to experience Italy from across the Atlantic. But what I don't get is that moment of hesitation you had when hubby suggested you stay on a week for research? Huh? Thanks, Supriya. You know, I think it's important to know the place your are writing about, wherever it is. It doesn't have to be exotic, like Italy or Mumbai; the important thing is to know the place. I read a mystery some years ago that was well plotted and had good twists. Then the author lost me when s/he had a group of people running along the long corridors leading to gates at Dulles Airport. That airport doesn't have long corridors; it has "people movers" that are like moveable waiting rooms. It's unique, and the writer hadn't done good research. That was before internet days, so the research would have been more difficult than today. But it was a crucial error. Hello, everyone! My apologies for being absent until now. My day took a full turn in an opposite direction- totally unexpectedly. It's late in Italy now, but not on the East Coast where I am. I'm more than happy to hang out as long as folks want to check in. Supriya, you are so right! I should never have hesitated at staying on. But, I still have those moments when I think, "well, there are the dogs to worry about, and there is the......" I'm trying to get over that. Again, my apologies, but I ended up at the eye doctor's for an emergency visit that took most of the day. All is well, just the loss of email, talking with you all, and trying to see out of one eye.